I adore picnics. I love the chance to hang out with friends on a lazy day, with a bit of music, and to top it off its a cheap day out! I had my first picnic today with a very close friend of mine, which made me get excited about picnic season starting again! Here we are today in Alexandra Palace; I love how you can see the whole London sky-line from there! 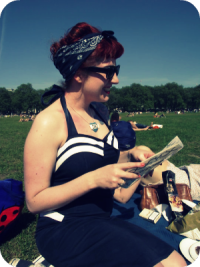 It then made me remember the awesome summer days I have had in London parks. I already have my next one lined up, and hopefully the weather holds up and I can make them regular features of my life again! I asked on Twitter about perfect picnic food and got some great suggestions, so I may start being a little more adventurous!